Workman Publishing Company, 9780761182382, 256pp. It’s the perfect meeting of minds. One, a general whose epigrammatic lessons on strategy offer timeless insight and wisdom. And the other, a visual thinker whose succinct diagrams and charts give readers a fresh way of looking at life’s challenges and opportunities. 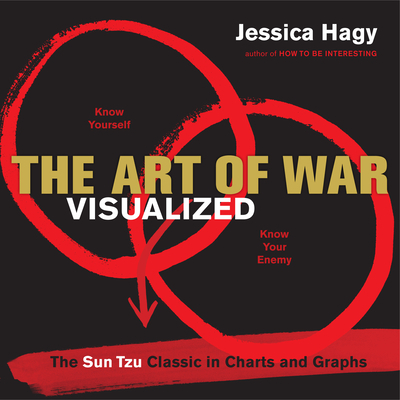 A Bronze Age/Information Age marriage of Sun Tzu and Jessica Hagy, The Art of War Visualized is an inspired mash-up, a work that completely reenergizes the perennial bestseller and makes it accessible to a new generation of students, entrepreneurs, business leaders, artists, seekers, lovers of games and game theory, and anyone else who knows the value of seeking guidance for the future in the teachings of the past. It’s as if Sun Tzu got a 21st-century do-over. Author and illustrator of How to Be Interesting, Jessica Hagy is a cutting-edge thinker whose language—comprising circles, arrows, and lines and the well-chosen word or two—makes her an ideal philosopher for our ever-more-visual culture. Her charts and diagrams are deceptively simple, often funny, and always thought-provoking. She knows how to communicate not only ideas but the complex process of thinking itself, complete with its twists and surprises. For The Art of War Visualized, she presents her vision in evocative ink-brush art and bold typography. The result is page after page in which each passage of the complete canonical text (in its best-known Lionel Giles translation) is visually interpreted in a singular diagram, chart, or other illustration—transforming, reenergizing, and making the classic dazzlingly accessible for a new generation of readers.